Detective Pitamber in the witness box at the Commission of Inquiry into the alleged plot to assassinate President David Granger. A Detective at the Major Crimes Unit of the Guyana Police Force on Friday came in for harsh criticism after he admitted to several apparent lapses during a probe of an alleged plot to assassinate President David Granger. The Commission of Inquiry, being conducted by Retired Assistant Police Commissioner, Paul Slowe, heard that Andre Gillard had alleged that after he had asked Nizam Khan to lend him GYD$6 million some time in 2015, he instead offered him GYD$7 million on condition that he would not have to repay the money but he would be required to kill President Granger. A long black gun was allegedly produced to Khan as the weapon that should have been used to assassinate the Guyanese leader. 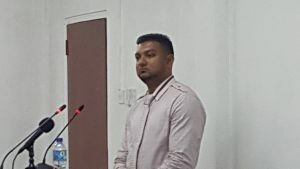 Detective Sergeant, Komal Pitamber, however, said apart from Khan’s licensed pistol, ammunition and firearm license that had been taken into possession by investigators, no other weapon had been found in the suspect’s home at Diamond, East Bank Demerara. Questioned by Attorney-at-Law, Christopher Ram, the detective acknowledged that one person alone could not plot. He said Guillard was a party to the plot but he was not treated as a part of the plot that was supposed to have been hatched in March 2015, but reported for the first time on March 29, 2017. Pitamber told the Commission that the file was sent to the Police Legal Adviser for advice, but he did not receive advice to institute charges. Under intense grilling by Slowe on day 2 of the Commission of Inquiry set up to ascertain if the police lapsed in conducting a thorough investigation of the alleged plan to kill the President, Sergeant Pitamber said he was assigned by Assistant Superintendent Mitchell Caesar. Saying that he had taken statements, conducted a search of Khan’s home without a search warrant and arranged a confrontation between Guillard and Khan, Sergeant Pitamber related that Guillard informed police that after he had refused to commit the act, his life was made miserable by Khan and other persons in the area and he opted to report the alleged plot to the Criminal Investigations Department headquarters after police at Grove Police Station were not taking any action in the matter. Pitamber, whose training included several one-week courses on Trafficking In Persons and a one-week course in major crimes, came in for harsh criticism by the Commissioner of Inquiry after it became apparent that a proper statement had not been prepared and several new areas emerged during his testimony in the witness box. When Slowe asked him why several aspects were not included in his statement to the Commission, Pitamber said “no sir…I don’t have any reason why it’s not in the statement.” After he denied that he neglected to prepare a proper statement because he did not remember to do so. After the Detective regurgitated the definition that a statement is a word-picture of what has transpired, the Commissioner of Inquiry said it was neglect or incompetence for those aspects to have been excluded intentionally or unintentionally. “I am saying to you if those things were not contained in the statement, you would not be giving people an accurate picture of what transpired and, therefore, is a neglect; if it is not neglect, then it is incompetence,” said the retired senior police officer. The Police Detective said he did not acquire a search warrant to search Nizam Khan’s house and yard because it would have taken too long to prepare and sign. Pressed on what that duration that could have been, he said 30 minutes. Under examination by Retired Justice Ian Chang, who is representing the Guyana Police Force, Pitamber said he opted to execute the search without a warrant because of the urgent nature of the probe. Moments earlier, in responding to Slowe’s question if he did not see it fit to obtain a search warrant, Pitamber said “I would have obtained one if he had denied police the search.” Slowe then reacted sharply: “I don’t understand that. You left CID headquarters with the intention of investigating this matter. You can’t know whether this man will permit you to search or not and you did not seek to ensure you cover yourself legally to search…That is not the type of policing that one would expect or I would expect from a Sergeant in the Major Crimes Investigation Unit,” said Slowe. Detective Pitamber was also chided for not seeking to find out who the male person was that Nizam Khan was speaking with and what was the nature of the conversation although it was a “major investigation” into a “serious allegation”. Slowe said “I find strange” that approach but said that was the policeman’s judgement. “You don’t know what might have been the nature of the conversation and if you went there with the mindset that you are to investigate a very serious matter, one would expect that everybody in the area would have been asked something but that is your judgment; can’t fault you for your judgement,” remarked Slowe. Pitamber could not recall whether he had recorded in his station diary or his personal diary that he and his colleagues had left for Diamond to investigate a serious crime. The Detective could not accurately demonstrate an estimated distance of 10 feet at which the vehicle with Guillard and corporal Deonarine were located from him. At one stage, Slowe stood to show the witness that he is 6 feet, 3 inches tall and the distance from the witness to the clock on the wall at the back of the room may be about 15 yards. “When I am shooting at the range, I know that from here to that clock is about 15 yards. I would never ever make that mistake and say that is about 10 feet but that is your judgement,” said Slowe, a professional rifleman. Pitamber said he told Nizam Khan and that he was under arrest. After the property was searched, he could not recall whether the suspect, who was not handcuffed, drove himself to CID Headquarters in his own vehicle or he was driven by Corporal Deonarine. The Police Detective said he did not know the law states that only Licensing and Certifying Officers can drive vehicles for which they have not been licensed to drive. Pitamber recalled that Nizam Khan declined to give a statement and denied the allegation during a confrontation with Guillard. The Detective said he did not know who was the lead investigator but conceded that he was the most senior person during that segment of the probe. Under examination by Chang later, he said he had taken instructions from Caesar with whom he had been in constant telephone contact through which guidance had been provided. He said Nizam Khan’s firearm and ammunition were lodged in the police property book. After the confrontation, Pitamber said he went home at about 9:30 PM on March 29, 2017 possibly without booking out, leaving behind Guillard and Khan at the station in the presence of Officer Sewsankar. “That is a major breach. You got to book your time leaving the station unless they got a new standing order,” he said. He said he asked permission to leave. He said he did not knpw what had transpired afterwards and then reported for duty the following afternoon. He said he did not seek to find out what were the contents of Nizam Khan’s statement that had been provided to Sewsankar. He said he had asked where was Khan and had been informed that he had been placed on bail the same night, but he did not seek to find out who had granted him bail or whether it was cash or self-bail. Pitamber said he found it strange that Khan was granted bail but he did not seek to find out who did so. Pitamber said he did not ask where were the firearm, ammunition and license that he had lodged and whether they were still at the station. The Detective said he never prepared a written report but one was prepared although he was unsure by whom. He said he did not keep abreast to know how many reports had been prepared. The policeman said he did not ask or know if the matter was reported to others senior officers, but he would have reasonable expected such a process to take place. He said he believed that a record was made in the occurrence or crime book because “I was of the view that a report was made by someone else.” He said he did not ask whether indeed such a record had been made. Among those expected to appear before the Commission of Inquiry next week are former ‘A’ Division Commander, Clifton Hicken and Head of the Criminal Investigations Department of the Guyana Police Force, Superintendent Wendell Blanhum. The Commission will review all actions taken by the Guyana Police Force and examine whether there was evidence failure, neglect or omission to thoroughly or properly investigate the intention or plan to assassinate the President and determine whether such failure or omission was intentional,” states the terms of reference.